My love affair with tomatoes began when I was a youngster following Mama down the rows of our home garden early in the mornings while the dew lingered on the produce. I held a basket while Mama pinched, patted and yes, smelled the tomatoes, choosing just the rights ones to bring to the kitchen. She often allowed me to pick a tomato that was dusted with salt and freshly ground black pepper to enjoy before breakfast. Those tomatoes were a highlight on warm summer days. When I lived in New Orleans in the 1970s, I was introduced to Creole tomatoes and I felt like I had indeed found the love of my life. I made daily runs to the market in the French Quarter to get those babies. When they weren’t available in the city, I thought nothing of riding down to Belle Chasse several times during the season to get a box or two of those juicy, red-ripe, delicious tomatoes. For breakfast, thick slices of tomato slices between two pieces of toast slathered with mayonnaise was a great way to begin the day. I also came to love tomatoes and sweet onions, seasoned with salt and freshly ground black pepper, and dotted with slivers of fresh basil and fresh mozzarella cheese or crumbled feta. Then again, a warm tart of tomatoes and cheese is nothing short of a bit of heaven in my book. Of course, I relish slow-roasted tomatoes dressed with fresh herbs, as well as tomatoes stuffed with spinach, and I enjoy a good juicy tomato, cut into quarters topped with homemade pimento cheese. I never let the tomato season end before making a batch of gazpacho. 1. Combine 1 (46-ounce) can tomato juice, 4 large ripe tomatoes (chopped), 1 medium-size green bell pepper (chopped), 2 ribs celery (chopped), ½ cup chopped sweet onions (such as a Vidalia or a Bermuda), ¼ cup minced green onions, 1 medium-size cucumber (peeled, seeded and chopped), ½ teaspoon minced garlic, 1 tablespoon finely chopped fresh basil leaves, 1 tablespoon finely chopped fresh cilantro leaves, 1 teaspoon salt (more or less to taste), ¼ teaspoon freshly ground black pepper (more or less to taste), 2 tablespoons extra-virgin olive oil (optional), 1 tablespoon red wine vinegar, 2 tablespoons fresh lime juice, 2 teaspoons Worcestershire sauce and ¼ teaspoon hot sauce (more or less to taste) in a large bowl and stir to mix. 2. Cover and chill in the refrigerator for at least four hours before serving. 3. It will last for about a week in the refrigerator and it only gets better with time. 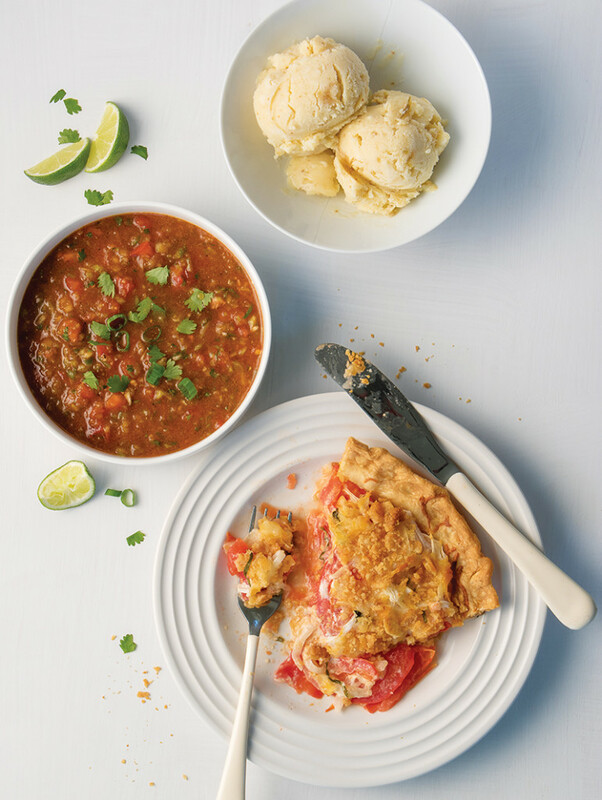 After the chilled soup, a warm tomato pie straight from the oven will tickle your taste buds. The recipe comes from my friend Mary Jane from South Carolina. She is always modest when it comes to her cooking, but this one has become one of my favorite tomato-season treats. Preheat oven to 350 F. Arrange sliced tomatoes in pie shell until it is filled almost to the edge of the rim. Then layer as follows: Spread with mayonnaise. Sprinkle the basil and arrange onion slices evenly on top. Sprinkle cheeses. Mix Ritz crackers with the butter. Sprinkle evenly over the top. Bake until golden brown, 30 to 45 minutes. Let cool slightly before slicing and serving with a spatula. Soaking the figs in liqueur prevents the fruit from freezing in the mixture while being churned. Counter-top ice cream makers are readily available, so indulge yourself and buy one. 1. Combine 1 quart ripe figs (peeled and mashed) and ½ cup Grand Marnier in a bowl and set aside. 2. In a large, heavy, nonreactive saucepan, combine 6 large eggs (lightly beaten), 4 cups of milk, 1 cup of sugar and 1 tablespoon of pure vanilla extract over medium heat and whisk to dissolve sugar. Bring to a gentle boil, stirring constantly, then reduce heat to medium-low. Continue stirring until the mixture thickens enough to coat a wooden spoon. Remove from heat and let cool for about 10 minutes. 3. Cover and refrigerate until well chilled. 4. Add fig mixture and stir to mix. Pour mixture into an ice cream maker and freeze according to the manufacturer’s directions. Transfer the ice cream to quart freezer containers to store in the freezer.